There are many criteria you can use to decide which Brazil poker sites deserve your attention, including the companies’ reputation in the industry, the speed of cashouts, and the reliability of the software. All the online gambling sites that we’ve chosen as the cream of the crop score well on these metrics, so we’ve decided to instead break them down by three other measures: the softness of the competition, the amount of rakeback they offer, and the amount of bonus money they provide to new clients. Every successful player knows that a big portion of his or her winrate comes from the mistakes that opponents make. This means that it’s in your best interest to find tables full of part-time, recreational players rather than savvy pros. We’ve looked closely at the user bases of each of our favored providers and ranked them according to the standard of play at each of them. As one of the leading sportsbooks in the world, Bodog attracts plenty of people who are knowledgeable about football, tennis, mixed martial arts, and other athletic contests, but they’re mostly clueless about Texas Hold'em and similar games. Add in a mix of casino blackjack and slot machine fans, and you have the perfect recipe for soft-as-butter tables. The firm has taken positive steps to become more recreational-friendly by hiding all players’ usernames and instituting a four table cap on the number of cash games anyone can play at the same time. Bodog formerly only served four countries in total, but it has recently expanded into a number of markets, including Brazil. TigerGaming is a popular online bookmaker with a clientele very similar to that of Bodog. It lacks some of the software innovations that Bodog has deployed, however, and so its games aren’t quite as wild and loose. TigerGaming eclipses many of the other sites around in terms of recurring promotions, so losing players have incentives to redeposit and try their luck again. The Bad Beat Jackpot is particularly notable for its ability to excite those who hope to win it and to also promote poor play by convincing people to go too far with their longshot draws. Intertops is another sportsbook that dabbles in poker (are we detecting a trend here?). The rewards scheme at Intertops is ideal for tight, solid players who can put in a decent volume of hands, so you will find a number of competent card players present. Nevertheless, there are other seats occupied by what can be charitably described as overly optimistic individuals. The games at Grand Poker are a mixed bag but overall very profitable. This room, affiliated with the massive gambling site 5Dimes (another reputable bookmaking organization), would have scored higher in our rankings were it not for the fact that poker room traffic is sparse. Yet, when you do encounter a running game that you wish to participate in, it’s likely to be filled with people who don’t know what they’re doing even as high as the $1/$2 blind level. Ya Poker is a great place to play, but it does tend to have some shark-infested games. This might be the best place on our list for tournament players, though, because MTTs here feature more amateurish competition than the ring games do, and they usually come with pretty hefty guarantees attached as well. A further benefit to Ya lies in its commitment to poker in Brazil. The company employs support personnel who are fluent in Portuguese, one of the few gambling sites that does. When you sign up for a rakeback account at Grand, you’ll get 50% of your rake paid back to you. This payment will be added to your account balance every Monday. Bonuses and other rewards are not deducted from your total rake when applying this enviable percentage. Intertops provides 36% dealt rakeback when you join the site through Professional Rakeback. Whenever you accrue a pending rakeback amount of $10, it will be transferred to your account the next day. Rake race winnings, bonuses, and other promotional monies aren’t deducted from your rake numbers, but all RB players at Intertops will earn out these promos at half the usual rate. Ya Poker’s 27% rakeback (with bonuses deducted) comes as a welcome boost to serious poker enthusiasts. 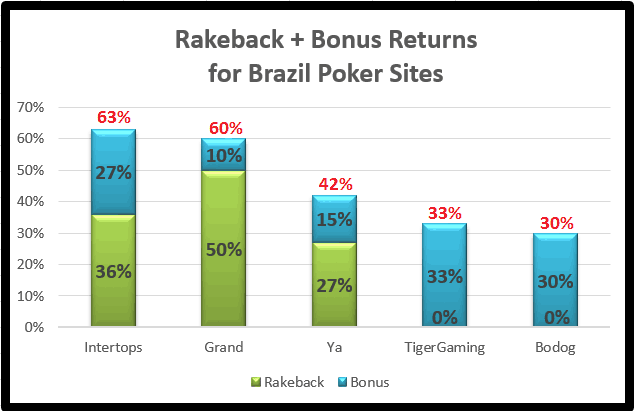 While the raw percentage isn’t really anything special among online Brazilian poker sites, the fact that there are enough tables running to easily multitable allows you to really increase the size of your rakeback payouts. You have control of the payment process because you can request an RB credit whenever you want through the gaming software. Grand Poker's 200% up to $2,500 initial bonus is at the top of the heap when it comes to the maximum amount available as well as percentage match. However, this bonus clears at a slow rate of 10% rakeback. Remember, though, that this adds on top of the 50% returns granted by Grand's RB deal (described above) for a total kickback of 60% while the bonus is active. The bonus at TigerGaming goes up to $2,500, just like at Grand, but it only matches your deposit 100% rather than 200%. Still, this money will move into your real money account a good deal more quickly because it's the equivalent of 33% RB. Intertops provides a 200% bonus up to $1,000, and it releases at quite a rapid clip: around 54% for non-rakeback players and 27% for those with a rakeback plan. Intertops also runs reload deposit bonuses several times per year that clear at the same fast pace although they're almost always capped at a smaller amount than the welcome offer. Bodog's 100% up to $1,000 welcome bonus is earned out in several stages. The first portions of it are worth more than 50% of your fees + rake. If you succeed in releasing the entire bonus sum, then it will be worth 30% back if you're an MTT or SNG player and a little bit less if you focus on cash games. When you make your first deposit at Ya Poker, you'll receive a bonus of 100% up to a maximum of $1,000. Although its clearance rate of 20% (15% for rakeback users) isn't spectacular, this bonus is probably the most convenient to use because you can request a bonus payment every time you qualify for another $1 of it. Now that you know all about the foremost Brazilian poker sites, you can choose to register an account at whichever one catches your fancy. In fact, you can sign up at multiple Brazil poker sites so that you can find out for yourself which ones suit you best. Whether you're just looking to play a couple of tables every once in a while or you intend to prepare yourself for a possible WSOP Brazil ring, online poker is a fine hobby that might even wind up padding your bank account a little bit. Check out our reviews below to learn how to join the gambling sites of your choice. After you begin playing, you might want to seek out ways of improving your performance at the tables. We've reviewed some of the most useful poker software products designed to give you an edge over your adversaries. If you've created an account at Ignition Poker, browse over to our description of the programs that are compatible with this room. If you play at some other site(s), then our recommendations of the best downloads for poker players in general are likely to meet with your approval.